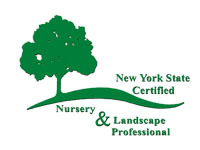 Aspinall's Landscaping is a full service design/build landscape firm serving the central new york area. We offer superior residential and commercial landscape design and construction services. We specialize in Paver Walkways and Patios, Pool Landscapes, Landscape Lighting, Landscape Design, Landscape Installation, and much more! Aspinall's Landscaping specializes in creating breathtaking landscapes and outdoor environments for many of the area's most prominent homeowners and developers. From the initial concept through the entire construction process, We will be working with you to ensure that your project is installed on time and in a professional manner unmatched by anyone else in the industry. Our goal is to provide our customers with a stress free experience. We have a talented staff of landscape designers that will assist you through the design process as well as through the remainder of the installation process. 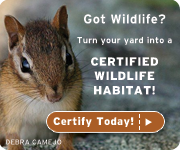 Our staff is highly trained and they are professionals in the field of landscape design and construction. You can be assured that you will be receiving the highest quality and professionalism when you choose to work with us on your project. 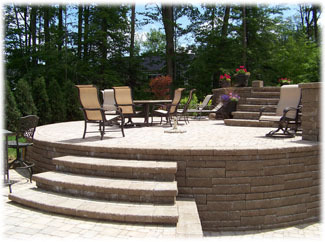 We customize stone retaining walls, walkways, stone patios to add a dramatic enhancement to any project. Whether we are constructing a small stone patio or an elaborate pool, outdoor kitchen and pool house, our masonry crews will exceed your expectations with our superior craftsmanship and attention to detail. 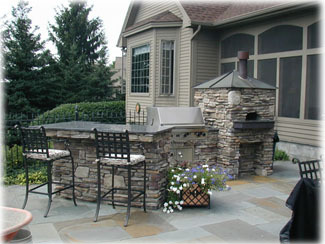 We have masonry crews that specialize in Natural Stone work to give your hardscape the old world / natural charm. Paver Driveways are quite popular in our area due to the wear and tear from snow-plowing. Installing a paver driveway will decrease maintenance and allow for repair when needed. Concrete Paver Driveways will often pay for themselves within 10-20 years depending upon size. We have an outstanding staff of pool and water feature designers. 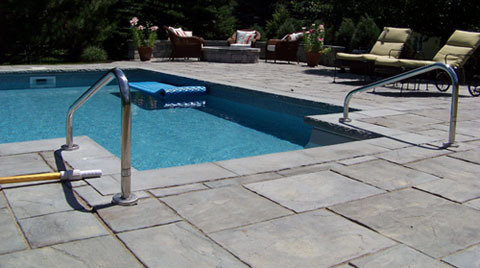 We feel that our team of designers produces a pool design that is second to none. Our team of designers and construction crews will make your project a reality. We can help with pool sizing, layout, and other important information. We have extensive experience installing spill-over hot tubs, waterfalls, creative coping edges, etc. 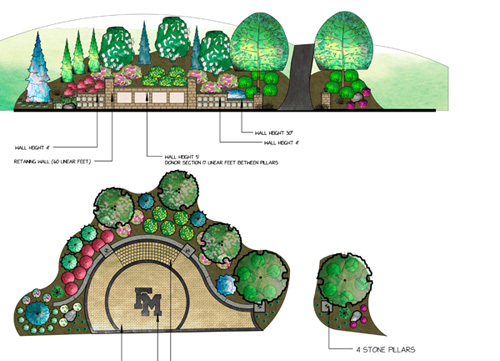 Feel free to contact us to help with the design of your future pool area! Proper design and construction is essential in all water features. Our professionals are extremely meticulous in the design and creation of every water feature we handle. This gives our customers the reassurance that the project is completed right the first time and that it will integrate seamlessly with the remainder of the project. Landscape lighting is an art. It requires the ability to understand the main principles of lighting levels, elements, form, balance, transitions and texture. Shadows can be just as important when designing a lighting installed. We often set up landscape lighting samples for our customers to help them visualize how we would typically light a landscape. This allows for great feedback and helps us create the atmosphere you desire. A beautifully lit landscape increases the value of your property and it enables you to enjoy all of its structural elements. 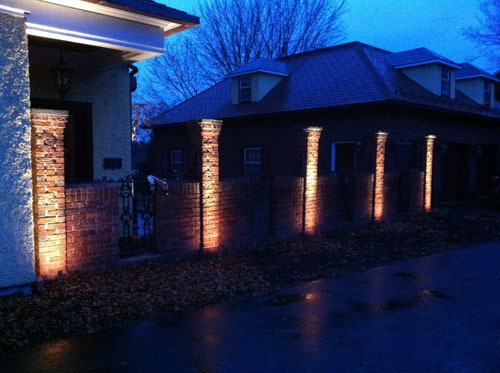 Contact us today if you are interested in a free Landscape Lighthing installation. 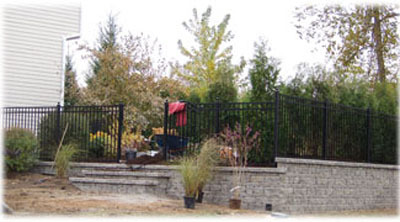 Retaining Walls are constructed for a number of reasons in the residential and commercial landscape. We will often times incorporate sitting walls and accent walls into a design to define areas and add interest. Properties on hills can be perfect canidates for creating terraces to make the property more functional. 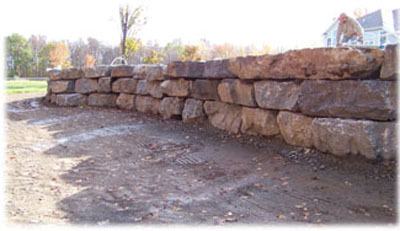 We construct walls using natural stone, boulders, and segmental retaining wall block. Each material can have advantages and disadvantages.